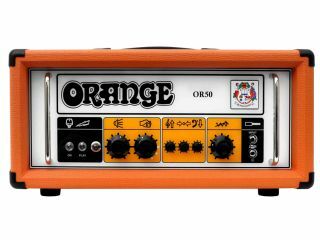 NAMM 2012 PRESS RELEASE: Orange Amplification celebrated its 40th anniversary in 2008 with the issue of an extremely limited guitar amp: the OR50H. Due to overwhelming public demand, Orange Amplification has decided to re-introduce it. In 1972 Orange launched an amp that defined their sound. It was dubbed the 'Pics Only' due to the absence of any text, instead using pictures only on the face plate of the amp. The OR50H owes more than a nod to this vintage legend; from the method of its construction, the blues and rock tone, even the cosmetics. Featuring a traditional single channel with a three stage gain section, the real weapon in the OR50's arsenal is the HF Drive control. This is two controls in one! As you turn the control clockwise you will hear the power amp presence increase while adding an extra dimension of power amp gain. Along with a foot-switchable master volume, this is truly one of the most versatile single channel amps ever created. The new OR15H offers an alternative specification for those looking for a 15-watt Class A guitar amp, still delivering the vintage Orange tone and for the first time offering the Pics only styling in a smaller package. With incredible vintage tone and unmatched versatility, once heard you will be hooked on the OR series amplifiers for life! To take a look at these and all the other Orange Amps go to Orange Music Booth 4890 Hall C. Scan the 'Powered by Doppler' QR codes featured on every Orange product this year to enhance your experience with audio clips and video!